To earn charms to protect himself and Casca from the evil spirits drawn to their brands, Guts has agreed to help the apprentice witch Schrieke in defeating the trolls threatening the village. To aid them, Schrieke hands out magical weapons to Guts companions. Guts, however, needs only his sword. Now the trolls are attacking. Guts and his companions will have to buy Schrieke time to cast her spell before they mob of monsters overwhelm them and pillage the village. But with the fabric of reality merging with the astral realm, the trolls aren’t the only monsters lurking out there. Guts and his companions will have their hands full. This volume is the sort of action BERSERK is known for. Miura’s art is detailed and at once beautiful and horrifying. He captures the highs and lows of the fight as it ebbs back and forth. Schrieke’s magic evokes awe while the trolls and other monsters capture they’re mythological roots but with the disturbing twist of Miura’s imagination. An action-packed volume of the manga that keeps you turning pages. If you’re a fan of great fantasy, you need to read this series! BERSERK numbers among the best of fantasy art out there. 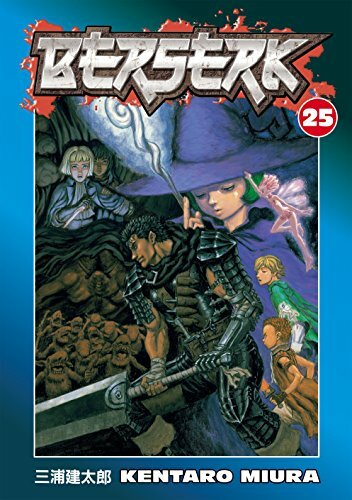 You can buy BERSERK Vol 25 from Amazon. Guts no longer travels alone. 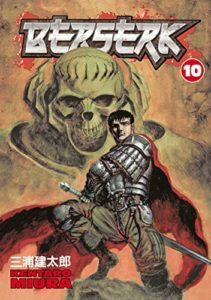 To protect Casca and get her to Elfheim where the broken, insane woman can be safe from the evil spirits drawn to her brand, Guts has allowed Isidro, Farness, and Serpico to travel with him. He can’t protect Casca from her madness and the darkness trying to kill them. Worse, he can’t trust himself around her. While traveling through the woods, the party is ambushed by trolls. Since Griffith’s rebirth, the boundary between the physical and spiritual worlds is weakening. Trolls, dwelling in the edges of the spirit realm, are rampaging through the woods and terrorizing a nearby village. Their ethereal bodies are impervious to normal weapons. Only a young witch named Schrieke can save them. Schrieke and her mistress are the only hope for the village in destroying the trolls, and helping Guts and Casca. But will they stir from their protected home? Or will Guts and his companions stumble on without their aid? 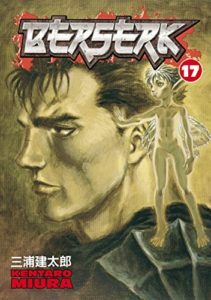 BERSERK is shifting more and more into the pure fantasy story, but the grimdark brutality still exists. The trolls are horrible creatures, squat and brutish. It will take the aid of magic to allow Guts and his group to continue on. Miura’s world develops more and more in this chapter as he dives into not only the metaphysics of his world, but whether the Godhand’s belief that causality controls all is the truth. Perhaps man has a choice when presented with their fate. But can they resist taking it? Griffith couldn’t resist sacrificing the Band of the Hawk to achieve his dream, but way back in Volume 3, the count did resist. 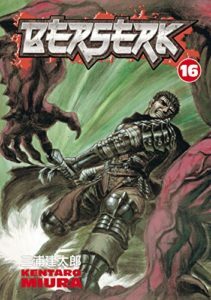 BERSERK continues to be an exciting read as Guts and his group deal with the trolls while Guts is beginning to remember what it was like to belong again. They’re not the Band of the Hawk, but has he found a new family to protect? A way to escape his destructive path of vengeance? 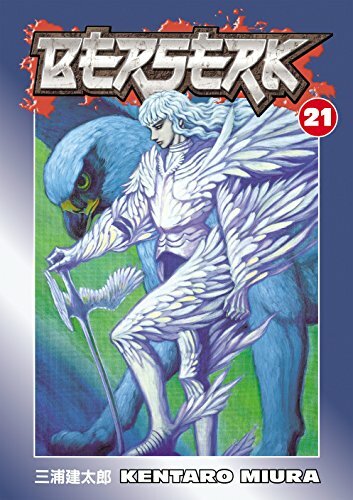 If you’re a fan of fantasy, you need to check out BESERK! You can buy BERSERK Vol 24 from Amazon. Guts has rescued Casca and returned her to Godo’s place only to learn that the old blacksmith has died. Rickert and Erica are excited to see Guts’s success while Guts is wondering what to do next. 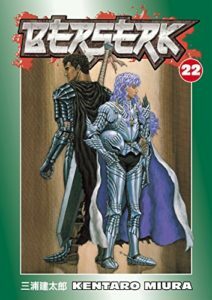 He’s rescued Casca while he suspects Griffith has been reborn in the chaos of Albion Monastery. 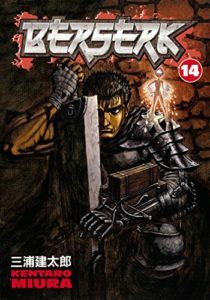 When a mysterious, silvery-haired figure has come to visit, Guts learns his suspicious are true. Griffith is back in the flesh, apparently human once more. Will Guts finally have his chance for revenge? Will Guts once again throw himself down the path of vengeance? While Guts faces Griffith, the Kushan army’s invasion worsens. They are butchering the peoples of midland. But there are those who have faith that the White Hawk will save them. Will Griffith be these peoples’ saviors, or the damnation? Miura shifts gears into the third part of Berserk, and the longest. This part still isn’t done. The art continues to be amazing. The characters emotions continue to shine as their passions collide. Miura’s storytelling continues to expand his world-building, laying the foundations for the new story lines to come. 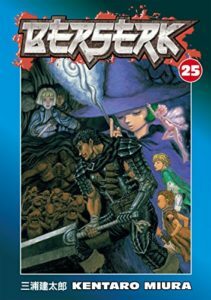 If you’re a fan of Fantasy, you should be reading BERSERK! It only gets better and better! You can buy BERSERK Vol 22 from Amazon. The built up torture and pain around Albion Monastery has combined with the wish of the Behleit Apostle. The negative energy surges through the refugees, consuming all who encounter it. Father Mozgus, transformed into a pseudo-apostle, sees himself as an avenging angel. He believes burning the witch will stop the madness. Only problem, the witch is Casca. Guts won’t let any touch the woman he loves. He has fought through so much pain to reach this moment. But Father Mozgus may prove too much for Guts to conquer. And even if he defeats the “angel” how can they survive the tide of darkness sweeping across everything, consuming all life it touches. And at the heart, the Godhand watches on as something new is birthed into the world, the final wish of the dying Behleit Apostle. Miura delivers one powerful ending to this volume. The action explodes across the pages. His art can depict the horror of the dark ooze dissolving all it touches to the titanic battle between Guts and Father Mozgus. The characters have to band together, helping each other. Guts can’t do it all on his own. He’s gaining his own followers. Like before, he’s learning to rely on people. First Isidro, but soon others. And at the end, when the dust settles, we’re left wandering now what? Where does the story go from here? Good thing we can keep reading. Once again this series shows how amazing fantasy graphic novels can be. Any fan of fantasy will love this series. It brims with beautiful words, horrific monsters, and engaging characters. It has it all! 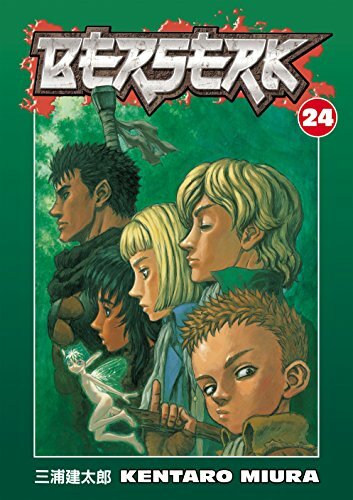 You can buy BERSERK Vol 21 from Amazon. 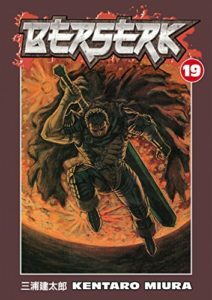 Newly recovered from his injures suffered from the eclipse, Guts has to face his new life living in the boundary between life and death. Thanks to the brand he received when Griffith offered him a sacrifice, evil spirits seek to devour his soul. And he’s not the only one branded. Caska, her mind reduced to that of a child after being raped by the demonic Griffith, has no idea the danger she’s in. Guts has to race to her fast to protect her from the demons. But will it matter? Even if he saves her, she now fears and hates him, so traumatized by her experience. Her mind is broken. Nothing is ever the same. All that is left for Guts is vengeance. The Black Swordsman we met at the beginning of this series is born. Volume 14 also jumps us to two years later, putting is after the events of the early volume. Guts, now traveling with Puck, is about to find another one of the demonic apostles. He has another chance to find vengeance. Miura’s epic continues. For those who watched the original anime, this volume carries it beyond what that started. From here on out, the story isn’t known. We don’t know if Guts will survive his vengeance. We don’t know if Caska will ever regain her sanity. All we can do is march with Guts ever on, trying to defy fate in a world that has lost all hope and given in to evil. 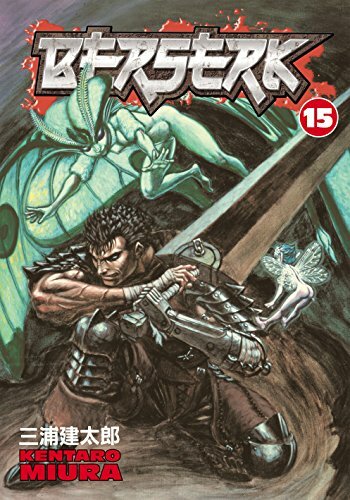 You can buy BERSERK Vol 14 from Amazon. The Band of the Hawk, rejoined by Guts, are ready to break Griffith out of jail. With the aid of Princess Charlotte, still in love with Griffith even after a year of his imprisonment, is willing to defy her father to save him. With Guts at the lead, Caska and the others venture into the dungeons. But what will they find in the darkest cell? It has been a year of torture for Griffith. Will they even find the same man they once followed? Or will they merely find a broken shell, so brutalized he’ll be an invalid for the rest of his life. As the Band ventures deeper, dark things move through the world. Something is gathering. A year ago, Guts was given a prophesy. The eclipse is coming, and the evil in the world coalesces to celebrate. Not only does Volume 10 have some powerful imagery in it, it does more to further the back story and set up so many theories about just what is going on with the Godhand, the enigmatic Knight of Skeleton, and more in this one chapter. Are we witnessing a cycle that happened a thousand years ago played out again? Maybe? What does that mean for the future of the series? So many great theories out there. The story continues to be incredible. The artwork captures the emotions, from the helpless suffering of Griffith, the determination of the sheltered princess, and the rage of Guts as he does the only thing he’s good at: swings his sword. The characters and art continues to excel. The passion bleeds off the page. This is writing and art mixed together to make something amazing, something only found in the medium of the comic. If you’re a fan of fantasy, especially the grimdark subgenre, you have to check out this novel. Fans of Bakker, Abercrombie, and Erikson will find so much in this series! You can buy BERSERK Vol 10 from Amazon.